watch you as you lie awake in bed. Prada's recent print ads tried to capture the mysterious allure of night creatures. (Below) Models perched on tree branches, half-hidden in the shadows of the urban jungle. Like owls and other predators – they looked ready to pounce on innocent prey. Let me tell you a chilling story about one such creature. One night, my driver, Guido, and his wife, who was then pregnant with their second child, were preparing to go to bed. Suddenly, they heard frantic voices from outside. He rushed to the wide open window and saw his sister and brother-in-law (who lived directly across them in old San Juan) on the ground, their arms pointing wildly towards the roof of their house. Guido promptly looked up and froze. His face turned white, and his skin crawled as he stared into the glowing red eyes of a tall shadowy figure. It glided over the tin roof towards him, arms outstretched like a skilled tightrope walker. After three horrific seconds of eye contact, the dark figure suddenly leaped off the roof. No one saw it hit the ground, and certainly no one heard it crash on the pavement. But where did it go? Was it an 'aswang', a bloodthirsty ghoul in Philippine folklore which fed on the innards of unborn babies? From time to time, Filipino urban legends such as this would surface like night creatures and strike terror in the hearts of believers. Often, they would spread through cheap tabloids, eclipsing public scandals that involved corrupt politicians and other dubious people in power. Waaah! Why did I have to read this story at 12:30am?!?! anonymous, I bought my first set in 2005. :-) By the way, someone just gave me a tip, Series 14 is already available on eBay. Thought you might want to know. Actually now what I really want is the Chanel one.. Do you know where can I buy that one? And how much is it? 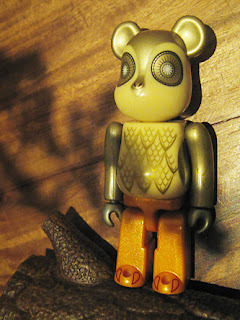 So.. All the be@rbrick photos you have in this site, are they all yours? Hehe sorry I just kinda excited or something. Anonymous: Chanel Be@rbricks were given by Karl Lagerfeld to New York Fashion Editors last year as gifts. However, some ended up on eBay, and sold out for as much as US$400 to 5,999! There must have been a reissue, as this Bearbrick showed up again at the Hong Kong Blood Cancer Foundation Auction last May. All the main photographs in the main entries, except the Chanel and the White Uotakes, were taken by me using my own Be@rbricks. The pics in the sidebar are credited to their respective sources.